Sandra was born in Stockholm, Sweden in 1972 and still lives there with her husband, who she met at age 17. They have two sons, 16 and 21, and a dog, a Kooikerhondje. Susan: Welcome, Sandra and thank you for being here today. Can you tell our readers a little bit about yourself and your journey to becoming a published author? Sandra: I grew up in a dysfunctional family and had some hard years before I knew what I wanted to do: work with children. I studied at the university and later on worked with children with or without diagnoses in special schools. I was now married, had two children and my past was haunting me. One day I decided to go back in my past and try to understand what had happened in my family. The research I did ended up in my first book, the autobiographical narrativeThe Dandelion Kid (2006). The book became very acclaimed and I presented it in readings and conference discussions over the following seven years. In 2010 I published the psychological thriller Seared, and in May of 2014 my second psychological thriller The Rival appeared. In August 2015 my fourth book, Skinless was released in Sweden. Susan: What is Seared about? Sandra: It´s about secrets, the things in our life that we don´t want anyone to know about. Things that may be hard to tell – and hear about. Susan: Can you tell us more about Helena? She sounds like a time-bomb waiting to explode! Sandra: Oh, she is! She is the type of person that carries her secrets inside because it´s too painful to reveal. She doesn´t trust people, because so many have treated her very badly. Susan: What is it that calls you to write psychological thrillers? Sandra: Our minds. I´m very interested in how we act under pressure, when we are threatened, when people around us behave in a way that gets us out of balance. What would it take for us, for example, to kill another person? How about lying to protect someone? And when do we stop lying – and why? Susan: Where do you get your inspiration for your work? How do you keep things “fresh” so to speak, in such a popular genre? Sandra: I watch people, listen to them, and just realize that there is so much that we say that isn´t true. Sometimes we say things just to avoid pain. Susan: What kind of reaction to your writing do you most seek from your audience? Sandra: I want them to feel – anything! A friend of mine said that I write “feel-bad-lit”, and I can only agree. Reading my books is like … riding a roller coaster. Susan: What is the best advice you’ve ever received, about your writing or life in general? Sandra: To write as if no one else is going to read it. Not to start thinking about what people may think about the text. Susan: What do you like to do in your free time, that is, if you have any! Susan: You have been working on your third novel Skinless. What is it about and when will it be available? Susan: Where readers can follow you and check out your books? Sandra: Yes, follow me on Twitter at SandraGsson, on Facebook at SandraGustafsson.writer, and on Instagram at sandragssons. Susan: Sandra, it has been a pleasure chatting with you, and I look forward to seeing many more books from you in the future. Sandra: Thank you, let’s do this again sometime! 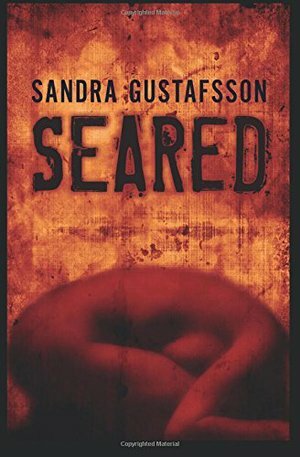 This entry was posted in Fiction, Interviews, Mystery/Thriller and tagged author interview, Sandra Gustafsson, Seared. Bookmark the permalink.